Fried rice is always our family's favorite. When time is limited to prepare food in the morning, fried rice is always a good choice to pick for the menu :o) Today's bento is using ham-fried rice but I wrap it with omelet and tie it with Chinese Chives 韭菜 ( it's called 'kucai' in Indonesia). However I think the omelet is too thick. 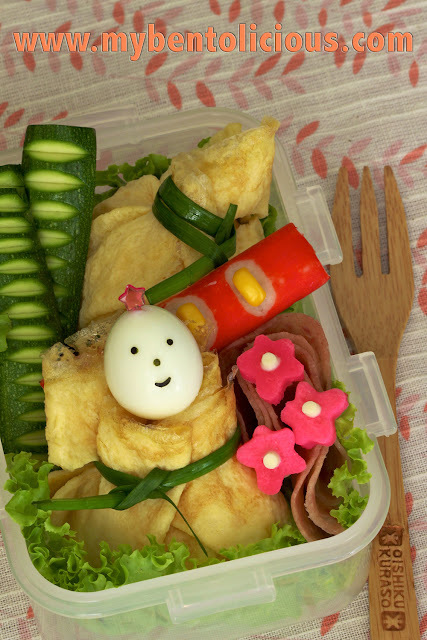 Put a boiled quail egg on the top and decorate with a smiling face from nori. Put zucchini for veggie and crab stick & salami for meat in the bento. I also make these small flowers from kamaboko かまぼこ (take the pink part only). When you wrap the rice, don't put the rice too much. Remember that you have to spare some space on the top. And you have to be careful for not to tie the omelet too hard or else the omelet will torn out. thanks a lot Zuna for always support me for doing bento :o) Have a nice weekend yah!! love how you did the zucchini! Iu may have to try that.... if you don't mind!